As the world stands at the precipice of a third world war, eerie satellite images show that North Korea is likely getting ready for another nuclear test. The new images are reigniting fears that this could be the final straw that would officially lead to world war 3. Dramatic satellite images taken earlier this month show disturbing activity on a barge that supports the development of a deadly nuclear submarine. 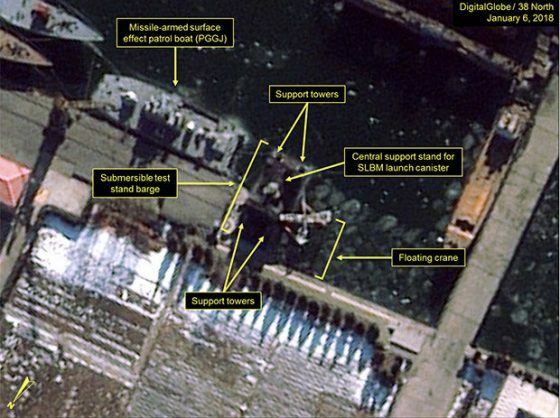 The photos show activity on a second submersible ballistic missile test stand barge at the Nampo Navy Shipyard, a seaport in South Pyongan Province. This particular barge supported the development of the deadly Pukguksong-1 SLBM and the SINPO-Class experimental ballistic missile submarine. The photo below was taken by satellite on January 6, 2018. The fitting-out dock is used when vessels need systems such as pumps or electrics to be installed and minor work to be completed before being placed into devastating service. Since the last set of images were taken in December, the barge now has a small floating crane moored alongside it. Though the purpose of the work is unclear, it is probably related to final stages of repair before declaring the barge operational, reported Express.co.uk. It comes as Kim Jong-un’s repeated tests of his atomic arsenal have caused tensions to heat up in Asia, bringing condemnation from numerous powers and fanned World War 3 fears. This news also surfaces as a nuclear scientist, who has frequently visited North Korea, warned that the nation could have an atomic bomb capable of fitting onto a missile. The director of Los Alamos National Laboratory Sig Hecker said that the rogue regime could also have anywhere between 30 and 60 small mobile nuclear warheads. “This to me is one that I would call a spherical fission bomb, in other words, the atomic bomb,” Hecker said. “It looks like a simple bomb. However what I found most important about this is the size of it, it looks to be about 60 centimeters. Photos from almost two years ago show North Korea’s tyrannical dictator posing with what he claimed was a nuclear warhead small enough to be mounted on a missile.